The Cave of Magdalene ………….a French experience. “To those who travel to the South of France and climb the mountain through the forest up to her cave - the summit of human and divine affections. May you be blessed abundantly. (Paula Lawlor ‘A Love Devout’) The spirit and teachings Mary Magdalene, Miriam of Magdala, is emerging with force at this time. She brings the mystical feminine Christ Consciousness in a form that has had very little credit in earlier historical periods, but is ripe, perfect and powerful for us now. 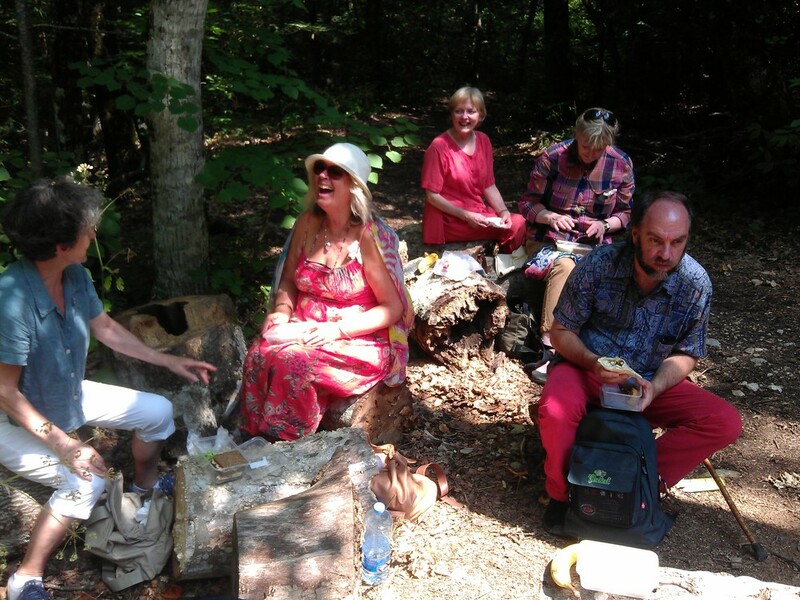 It was this energy that led me to hold our Magdalene retreat in the south of France in 2013; this and the invitation from Susie to host us in her delightful house, beautiful garden and newly converted barn in the medieval village of Durfort in the South of France. Our group with a nun waiting for the pilgrimage to begin. This land is the sacred ground where people have honoured and worshiped Magdalene for centuries. The story tells us that Mary Magdalene arrived, in a rudder-less boat, on the coast of Provence, where she preached and taught the message of transforming Love, converting the royal family and the whole population. She then spent the last 30 years of her life in prayer and meditation in a mountain cave in the sacred forest of La Saint Baume. As the story goes, her only sustenance was the Holy Eucharist, which she received on a daily basis from angels. During her waning years, the angels descended from heaven and transported her to an undisclosed location. There she feasted on celestial harmonies and witnessed the Rapture. It was our pilgrimage to this place on her saint’s day that formed the centre of our retreat. Though the week was full of many delights, “self exploration, inspiration, friendship and total joy” (Genie), it is the power of this pilgrimage experience that we want to share with you. On July 22nd we all rose early and set off in two people carriers, breakfasting on the way, to join other pilgrims in the mountains at La Saint Baume. On arrival we were struck by the energy of profound gentle peace of Dominican Hostelry at the bottom of the pilgrimage site, and of the monks and nuns who care for it. Our group was made up of men and women of differing beliefs and spiritual paths, some of whom were consciously drawn by Magdalene and others who were not so sure , to begin with, why they were drawn here. I had warned everyone before we left that a ‘relic’ would be carried up the mountain, mass was to be held at the cave and that some people might find it all too ‘Catholic’. I told them not to worry that the forest was very ancient and sacred to the Celts long before Christianity. “ Since prehistoric times The Sainte Baume was known as the Sacred Mountain of Marsailles. It was a place of worship of fertility which included the Artemis of Ephesus.” ( Paula Lawlor). Also in the cave there are many places, including a ‘cellar’, and many statues where you can find your own ritual relationship and connection with the Magdalene. In fact the procession felt so integrated with the forest and the mass was so filled with grace that everyone joined in willingly! More of that later, perhaps I should pause here to speak about truth, legends and grace. “The history starts in the 11th century, the tradition in the 1st. They are not the same but they come together before what is: sacred places we all need. “(Yves Bridonneau). I read a while back that one of the Dominican monks who takes care of the cave said, “ I can not know if Mary Magdalene was actually here in the first century, but I do know that she is here now.” The reverence and love for Mary Magdalene is palpable in this part of France. In the middle ages she was seen as the sinner who was redeemed and became a great saint, she is known as a free and powerful spiritual teacher and close companion of Christ, sometimes as his wife and mother of his child. “People feel they have seen a woman with brilliant eyes, dancing not walking, with her hair wrapped around her like a coat. History is too categorical and bases itself on facts, not on love or the radiance of her heart.” (Jacqueline Kelen). And so, led by the Dominicans, with a few hundred other pilgrims of many nationalities, we began the ascent. The road curved through the forest, sometimes easy, sometimes steep. It was still morning and the path is shaded by beautiful old trees, yet the heat of July was inescapable. The fittest in our group kept apace of the front of the procession, which would stop from time to time for prayer; others, because of health problems, were concerned about reaching the cave. Everyone did reach the cave and in time for the service. On the way up –“I give you music to dissolve the veils. I give you waters to soothe and cleanse the soul. I give, you give, it is all one. One LOVE” (Magdalene through Fay). Most of us rested from time to time. My favourite resting place was by “La source Nans” – a spring coming directly out of the mountain. I had just come across Neesa, one of our group, sitting like a nature spirit by a tree. We drank from the spring, filled our water bottles and, drenching each other with the cool pure water, we called in goddess blessings from our Earth Mother and the Divine Mother – glorious! From this point pilgrims are asked to walk in silence. “I walked through this mystical forest deep in Provence , that eventually leads to the steps that take us to the cave where Mary Magdalene dwelt. Somewhere I have been longing visit. Driven by inspiration together with Magdalena’s words and story I moved onwards .At this stage the heat and upward climb caught up with me and I did not want it to prevent my progress. I offered up a prayer to Magdalena for support to continue. Immediately, in the distance a flight of stairs was in sight ,giving me inspiration to walk on . When arriving at that site it had evaporated so I trekked on further and then the stairs to the sacred place presented themselves. Divine Magdalena had responded to my prayer and showed me the way forward. I had arrived at her cave. On entering I was overwhelmed with the presence of so many people and pilgrims all here to pay reverence to the Divine Magdalene .The cave was a natural Cathedral ,with an altar and statues. I found a place to absorb the service that had started ,in french, but spoke its essence. I was here, and I felt her energy " COME HOME ,YOU ARE HOME". (Susan). The final approach. The final approach to the cave is up many steps. I had been dreading these but somehow, knowing our goal was near, I found them very easy to climb. And then we reach the cave itself: its large opening now covered by stain-glass windows and a large door. Inside there are statues and altars, but it is still very much a cave; cool, damp, smelling of incense, earth and rock dust. As we entered a powerful energy hit us. How can I explain it? It was a feeling of warmth from all the people in there, and something more eternal - well just pure Love. It is true, the pure Magdalene energy enfolds you and gently opens your heart to the positive feminine state of surrender to Divine Love. One of the altars in the cave. The mass was in French so I could only catch some words. I noticed that the words heart and love kept recurring. As the service continued the sense of being within the sacred kept growing. Of course I had to go through my ’judgements’ to begin with – ‘here we are again in the holy heart of the goddess with men running the whole thing’. But the chanting and singing of these gentle monks soon melted my heart and I found myself in a state of profound altered consciousness. It was then I inwardly heard the words ‘Everything is forgiven” and I had a sense of unimaginable joy and ease; everything is and has always been forgiven – wow! Behind the main altar during the mass. I wonder if this Bishop has read ‘The gospel of Mary Magdalene’ ? As we left the cave with crowds of other pilgrims we were greeted with a breath-taking vista. I noticed a lightness in our group. Returning, downhill through the forest one man, who had been quite tense before, literally danced most of the way. We stopped in the forest for a picnic lunch, but next time I will stay longer. It was only at the end of our walk that I discovered another route that leads you down through the ancient trees – some believed to be 3000 years old. Even so the magic of the forest wove its spell and other group members reported extraordinary experiences. After La Saint Baume we visited the nearby Basilica of St Maximum, where Magdalene’s skull is said to reside. Then we headed home, stopping on the way for a meal; but the real digestion was on a level beyond the body and beyond words. A couple of days later we were sharing our experience of that day by using modelling clay. Clay, earth itself, it a wonderful way of grounding and helping us to make manifest our feeling experience. What unfolded was such closeness, openness and variety of visual and spoken sharings. I tried to make a head of Mary Magdalene but Jesus would keep coming in. The finished piece is a head that is half Mary and half Jesus. Somehow it worked, and somehow for me it said so much about Magdalene’s teaching. She teaches us about intimacy on all levels. She brings forward the divine feminine energy in order for it to join with the sacred masculine. It is the bride turning up fully for the sacred marriage from which comes Divine Union. I’ll leave you we a poem that Susie and I found in the crypt of St Maximum when we went on a planning visit last Easter. Susie and a French friend translated it into English. When we returned to the Basilica in July it was nowhere to be found. I hope this will have some blessing relevant to people of all faiths. "Mary Magdalene, Beautiful saint of Provence. You, who was healed and saved by Jesus, return us to the splendour of our souls and the Beauty of God. You, faithful disciple and woman who sees and hears, anchor our hearts in the word of Life. Help us to hear, to hold and to put into practice the teachings of Christ our Lord and Saviour. You, who have known tears and have spread the perfume of Love, comfort all those who suffer, pouring forth your balm to soothe our souls. You, loyal servant at the Cross and Tomb, Allow us the Grace of Hope during our many struggles, Strength during our trials, Faith in Eternal Life at the moment of death. You, you were the first to see the Risen Lord, and deservedly so. You received the mission to tell his disciples you had seen him. Make of us, honourable and courageous witnesses of the Risen Christ in His Eternal Glory."